A delicious chicken soup with dill and peppers. The true Jewish penicillin! 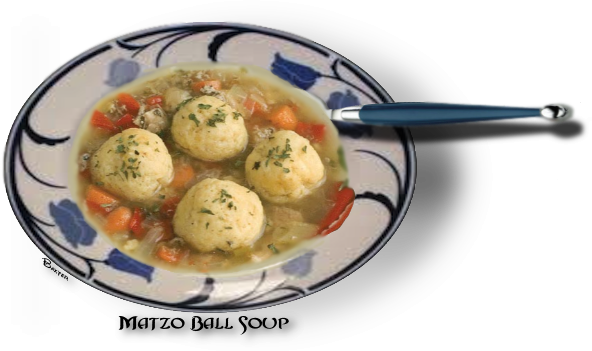 Matzo balls are a traditional Ashkenazi Jewish dumpling made from matzah meal. Traditionally, the fat had been "schmaltz", (chicken fat), which imparts a distinctive flavor, but vegetable oils or margarine may be used. Butter is not used, as milk products are not allowed to be used in chicken (meat) soup in accordance with the rules of kashrut. smooth. Stir in water, then let mixture stand for 20 minutes so matzo meal absorbs liquid. slide balls into boiling water. Cover and simmer over low heat for about 30 minutes or until firm. 1. (Chicken soup can be kept 3 days in refrigerator or can be frozen; reheat before serving. gently in cooking liquid or in soup.